Wildest Dreams January ‘Into The Jungle’ Unboxing! Hi everyone! Today I’m sharing my unboxing of my January Wildest Dreams book box. For those of you who may not have heard of this brilliant new UK based book box, you can find all the details by going to Zoe’s website here. If books, tea and bath products are your thing, then you really can’t go wrong! All for an amazing price too! Beware, there are definite SPOILERS ahead so if you subscribe and haven’t opened/received your box yet, please don’t look any further! Otherwise, I hope you are prepared to be impressed! The theme for January’s box was ‘Into the Jungle’ and I was 100% sure that I knew which book the box would contain (I was right!). This didn’t matter to me as I had already been lucky enough to read a proof of said book and had thoroughly enjoyed it. So I was thrilled to know I had a beautiful finished copy coming my way! The first item I pulled out of the box was this Geeky Clean Tea-Rex room spray. I’ve not actually sprayed this yet so I can’t tell you what it smells like but I’ve heard from others that it’s really lovely. I’ve not had a product like this in a book box before so I was pleased with this. I really like Geeky Clean products and would recommend you trying them out! Next up was this fab ‘Dino DNA’ tea by Rosie Lea Tea. I really LOVE this and thought it fitted the theme of the box just perfectly. The fact it came in a test tube was just perfect! I’ll have to make sure I try this soon. Then it was time for the book! As I had expected (and hoped), the book for this box was the newly released The Extinction Trials by S. M. Wilson. This book is seriously good and I highly recommend you give it a try – dinosaurs and YA? What’s not to like! You can check out my full (gushing) review here. The box also included a signed book plate and a note from the author which I thought was a lovely touch. And that’s it! As well as the addition of some tasty chocolate coins. I really liked this box a lot and am really pleased with it. I also think this box is great value for money in comparison to some I have tried previously and I love that I get to support Zoe who is such a fantastic blogger/vlogger and all around lovely person. I’m looking forward to February’s box, although I’m about 99% sure I know the book for this one too! This subscription box looks fun! 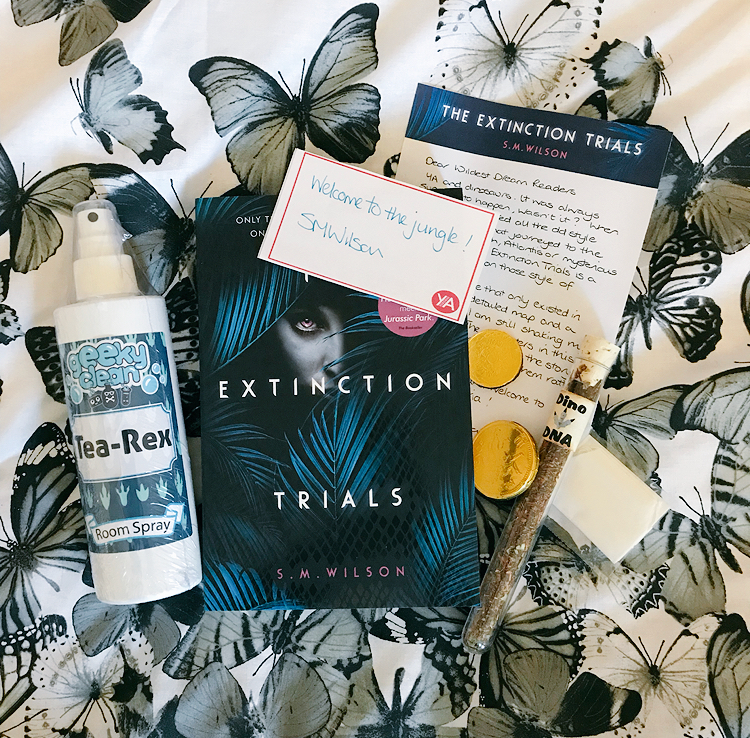 I’ve never heard of The Extinction Trials, but I put it on my TBR because it sounds so good. Especially a book about dinosuars! Omg, The Extinction Trials is really fantastic – I hope you enjoy it! I’ve been tempted to subscribe to this box as it’s such a reasonable price! It’s such great value for money too. The books seem pretty easy to guess at the moment but I don’t mind that as I can make sure I don’t end up with two copies! Looks awesome! I’m in the US, though, so shipping would probably be a drawback for me. Thank you so much Lilly! This box is fantastic and I’m so proud of Zoe for creating it! I think I’ve guessed the next book too but I’ve not read it yet and I am so excited. I loved this Into the Jungle box. The tea is delicious.